Every fall, elk engage in their annual mating ritual otherwise known as the rut. 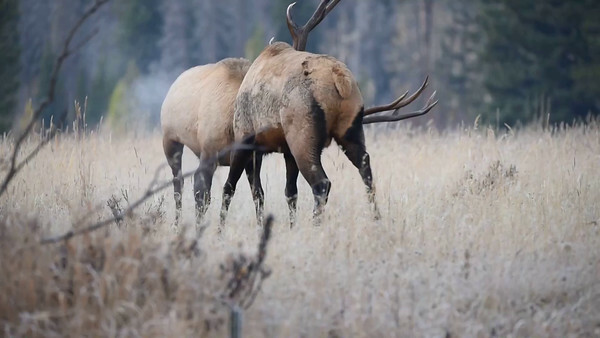 During the rut, bull elks reunite with the cows and calves with the goal of herding the cows into a harem. The bulls use a variety of vocalizations, or bugles, to communicate with both other bulls and cows. The bugle can be used to locate other elk, to display dominance, or to challenge and intimidate other bulls competing for the same cows. Oftentimes, this competition can lead to physical altercations. Oftentimes, younger bulls who have not established their own harem will linger on the fringes of a nearby herd awaiting their opportunity to mate. These younger bulls will often spar with each other, hoping to sharpen their battle skills for the day they might be able to challenge an older bull.